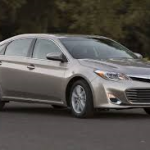 The field is full of competition for the Avalon and includes such capable sedans as Nissan Maxima, Chrysler 300, Hyundai Azera, Chevy Impala , Buick LaCrosse, and Kia Cadenza. It helps that Toyota has put a little more style into the Avalon. A rather boring offering for several years, the Avalon more closely resembles its Lexus cousin. The updated interior is more luxurious and worthy of a $37,000 price tag. The Avalonâ€™s plush and comfortable interior is welcoming. Rear-seat passengers will find legroom generous. The 8-way power driverâ€™s seat offers a position for all manner of drivers, and locking it into memory is helpful. Not a form-fitting seat (and needing more lateral support), still it is supportive and substantial. Our test car-the XLE Touring Sport edition, available for a limited time-will appeal to those who are looking for a mix of luxury and performance. With sharper lines, the 2015 Avalon includes a chrome-accented grille, LED taillights, dual exhaust and Quadrabeam headlights. All new. A sedan with ho-hum looks and spirit, Avalon may now attract a new set of buyers. The 2015 restyle although not radical or unique, is definitely an improvement over previous designs. 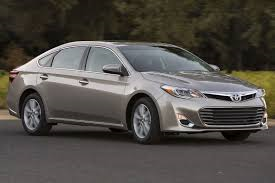 With a refined powertrain, Avalon is more responsive than the car it replaces. Safety and convenience abound on the Avalon. VSC, TRAC, ABE and EBO with brake assist. Separate rear side-thorax airbags and front knee airbags are standard equipment and help to boost the Avalonâ€™s crash-test rating. Also standard is a rear Cross Traffic Alert system which uses sensors in the rear quarter panels to detect other vehicles as they approach from the side or rear. All models come equipped with a backup camera, and Blind Spot Monitor on the XLE Touring and Hybrid XLE Touring models. All Avalon trim levels come well-equipped with plenty of comfort features, while the top-of-the-line Limited models are optioned up like a Lexus. Top Limited models cost around $40k but are competitive. EPA Fuel economy: 21/31 mpg. Todayâ€™s news is full of articles about the buying power and habits of the â€œmillennials,â€ which has an estimated population of 78 million. This Womenâ€™s Wednesday is part of a multi-part series we are exploring about women buyers within this segment. Of millennial buyers, 53% are female. Understanding the nuances of selling to this new generation of women can put your dealership in a position to leverage the newest car buyers and truly increase your market share in todayâ€™s ever competitive industry. 1. While â€œexcited/excitementâ€ is the #1 emotion the buyer felt while shopping for a car, millennials report â€œrelaxedâ€ as being number two, versus â€œapprehensiveâ€ for non-millennials. Three of every five (60 percent) of millenial women learned about finances from their parents. Only 43 percent of non-millennial women learned finances from their parents. 2. â€œTrustworthinessâ€ and â€œrespectâ€ are ranked #1 and #2 for millennialsâ€™ reason to buy from a sales advisor. â€œUnderstandingâ€ replaces â€œknowledgeableâ€ as #3. Millennials visit slightly more dealerships to look for a car. Sales advisors will benefit from listening carefully to what their millennial shopper is saying and provide honest answers to her questions. A prepared buyer doesnâ€™t need help with all of the decisions. Learning to perceive where the grey areas are can help accelerate a sales decision. Be there to help, not coerce. And listen, donâ€™t lead. What is the best source of information on a new car? It is the vehicle window sticker, or Monroney. Anyone who has ever shopped for a car is familiar with this sticker provided by the manufacturer. Required by law, the window sticker varies by manufacturer, but will contain the same information. Changed only slightly over the years, the information provided includes the EPA fuel economy, shipping information, vehicle identification number (VIN), optional equipment, pricing, parts content, standard equipment and warranty information. Included here is the basic model information for the vehicle. Most often located in the top left or right corner of the sticker, It provides the engine and transmission information, exterior and interior color, the year and trim level of the vehicle. The equipment listed in this section of the window sticker includes all the items and features included in the manufacturer’s suggested retail price (MSRP). Items listed here should be consistent with other vehicles in this trim level. These items are grouped into such categories as: Exterior, Interior, Safety/Security, Comfort/Convenience and Mechanical/Performance. All available warranties are listed here, including the length of the new car’s bumper-to-bumper and powertrain warranties, as well as any roadside assistance package offered by the manufacturer. Some new cars also come with free maintenance programs, and that coverage is also listed here. Listed here are those factory-installed options included on this particular model. Some carmakers bundle them into packages while others offer them alone. Sometimes the manufacturer will attach a supplemental window sticker with add-ons by the dealer. If you do find this added sticker with items you are not interested in, you may be able to negotiate them. The base price of the vehicle and a breakdown of options and fees are listed in this section. Other items that would appear here include the destination charge (cost of transporting the vehicle to dealer) and any gas-guzzler tax (levied on cars with a combined MPG of 22.5 or less). The total price of the vehicle is sometimes located here, but it often occupies its own space. Because todayâ€™s vehicleâ€™s are manufactured globally, buying â€œAmerican” is a thing of the past. Is a Chevy manufactured in Mexico more American than a Honda made in Ohio? It varies. In this section, shoppers will learn where the vehicle was assembled and often the percentage of U.S. and Canadian parts it contains. If this information is not listed and you want to determine what the percentages are, you can go to the National Highway Traffic Safety Administration (NTHSA) Web site. This section shows the total MSRP for the vehicle. That doesn’t mean you have to pay this price, but it does give you a point of reference in your negotiations. Use Edmunds’ True Market Value (TMVÂ®) to help you determine a fair price. Depending on the demand for the car, sometimes this “sticker price” is a fair price. Dealers and sales people vary a lot in their approach to selling a car. Some tell consumers â€œsticker is quicker,â€ meaning if you pay sticker price, the transaction will be faster. We donâ€™t recommend that you agree to pay â€˜sticker price.â€™ Most prices are negotiable. Besides, you want to do your homework, whether you are shopping on the Internet, in person or by phone. Price compare. The fuel economy label (EPA) provides the estimates of the vehicle’s fuel efficiency, and is located toward the bottom of the sticker. The combined MPG number is the most prominent and most important figure to note. New in 2013, the EPA label now provides more information than in the past. In the â€œFor Comparison Shoppingâ€ area, the manufacturer lists the â€˜classâ€™ of the vehicle; e.g., Large, Compact, Luxury, etc. Scanning this pixelated square with a smartphone camera links shoppers to the mobile EPA Web site. They can then customize their driving stats to get personalized fuel economy data. NHTSA tests a number of new vehicles every year and issues star ratings based on the results. This information can be found in the safety rating section of the window sticker. Occasionally, the Insurance Institute for Highway Safety (IIHS) scores also are displayed on the window sticker. Because NHTSA doesn’t test every car on the market, the safety-rating section will sometimes be blank. If this is the case, consumers can check the IIHS Web site. We reviewed the all-new 2016 Scion iM hatchback in July after an intro in Grand Rapids (http://www.chicagonow.com/girls-go-racing/2015/08/2016-scion-ia-â€¦m-introduction). Overall, we liked the iM, although found it a tad weak in the power department. Now, after our second preview, we have a more favorable impression of its assets, which are several for a compact vehicle. First off, the Scion iM is an all-new, but familiar compact. Sold as the Toyota Auris in Europe, the iM is a hatch equivalent of the ever-popular Toyota Corolla. A â€œreturn of the Corolla wagon, â€the iM will appeal to not only its target audience: young and active, but also to the Boomers (much like other Scion products, namely, the xB). While the iM offers a lot of goodies, it lacks some features common in competitive compacts. For instance, you wonâ€™t find any factory options, only one engine option slightly below average for other compacts (1.89-liter, 4-cylinder, 137 hp,.126 lb. ft. torque), active safety gear, blind spot monitoring, lane departure warning, or forward collision warning. What you will get includes a long list of standard features, including power windows/door locks, 17-inch wheels/tires, rearview camera, Bluetooth, touchscreen infotainment system, cruise, keyless ignition/entry, power folding/heated side mirrors, leather-wrapped steering wheel, auto headlights, and streaming Internet radio/HD. We especially like the dog-friendly accessory offered by Scion. With your pupâ€™s safety in mind, Scion offers a package that includes a pet barrier for the seat, unusual grass pad that mounts on the center console to keep your pet from standing there, door guards to prevent claw scratches, and a tether to keep your dog tied when running errands. Other standard features include 17-inch alloy wheels, a standard body kit, and free scheduled maintenance for two years/25,000-miles, whichever comes first. Included in the free-scheduled maintenance are oil changes, filters, tire rotation and scheduled inspections. This useful daily driver has a tight interior (cu. Ft. under 21), replaces the subcompact Scion xD. A sporty compact option, the iM is an entry-level vehicle starting at $18,460 ($795 destination). Scion subscribes to the â€˜no haggleâ€™ pricing regimen so expect to pay the price advertised. The iM is road-trip worthy, but donâ€™t expect to out-run the faster-moving vehicles when negotiating the on-ramp. This little 4-banger takes a longer time than we would like to get up to speed. Buyers can opt for navigation. The iM weighs in at 2,943 pounds, seats five and has a 14-gallon fuel tank. Fuel economy is respectable and averages between 27/28 (MT/CVT)-36/37 mpg. Not having driven a Toyota Yaris for some time, I was eager to make a comparison. As with all cars in this subcompact category, the Yaris is a good choice of vehicle for commuter driving. Would I want to drive it every day, on all road conditions? Probably not. In fact, in some ways, it seems superfluous with all the other choices out there today. And selling close to $20,000 doesnâ€™t make it any bargain. Nevertheless, itâ€™s a pleasant ride, ranking 35 out of 42 affordable small cars. This ranking is based on an analysis of published reviews and test drives, reliability and safety information. Our test Yaris was the 5-door LE Liftback version, equipped with Toyotaâ€™s four-cylinder 1.5-liter engine. Sufficient for â€˜urbanâ€™ driving, from A to B, the Yaris is available in L, LE and SE versions; the L and LE versions are available in two-door models, while L, LE and SE are available in four-door models. Fuel economy is predictable and reliable (average 32 mpg. ), and it seems to offer a little more in the way of upgrades. Performance is about what one would expect from a small four-cylinder engine. Although adequate for many driving routes, the transmission in the Yaris is just a 4-speed automatic; not as up-do-date as in other comparable automobiles equipped with six-speed automatics. The base 2015 Toyota Yarisâ€™ EPA-estimated rating is at 30/37 mpg city/highway. Handling is effortless and the ride fairly smooth, although not terribly quiet. There are smoother rides, to be sure, but for around town, the Yaris Liftback suffices. Interior space is generous, and materials good quality. Controls and buttons seem a little outdated but then itâ€™s not a vehicle that has a lot of pizzazz. Seating can be adjusted, the steering wheel doesnâ€™t telescope or tilt, so if youâ€™re 6â€™5 inches tall, it might be a tad tight. Standard features on the 2015 Yaris include Toyotaâ€™s Entune audio system, with 6.1-inch display screen, Bluetooth, voice recognition and USB port. Our test Yaris came equipped with the optional navigation upgrade ($899), which operated intuitively. Other standard features include keyless entry, steering-wheel mounted controls, cruise, A/C, 6-way adjustable driverâ€™s seat, split/fold rear seat, leather-trimmed steering wheel, and power door locks, windows. And remember, Toyota provides a free tank of gas. A tonneau cover is also standard to cover items in the liftback. Donâ€™t expect heated seats though. For smokers, Toyota still offers an optional ashtray kit. A mid-cycle refresh has updated the Yaris with attention to detail and interior refinements, as well as an updated appearance. The first since 2012, Yaris is due for a redesign. While Yaris may not stand out among the great many subcompacts available in todayâ€™s market, one can depend on Toyotaâ€™s reliability and resale values. Two other popular alternatives include the Kia Rio and Ford Fiesta, both updated of late. EPA fuel economy: 30/36 mpg. According to automotive writers, the fully redesigned 2015 Hyundai Genesis’ base engine delivers more than enough power for most drivers. Various reviewers report, the Genesis has nimble handling and feels composed on windy roads, though a few say that rivals like the BMW 5-Series are a bit more nimble. One can give praise for the cushioned ride in the Genesis luxury car. Equipped with all the amenities one expects in a luxury vehicle, Genesis comes with standard Intelligent Drive Mode system, which adjusts transmission, throttle and suspension settings for Normal, Sport, Snow and Eco modes, leather seating, Electronic Stability Control w/traction, nine airbags, including driver knee airbag, Automatic Emergency Braking, Blind Spot Detection w/rear cross-traffic alert, ABS with Electronic Brake Force Distribution and Brake Assist, Vehicle Stability Management System, 12-way power front seats, Tilt/Telescopic/Haptic Steering wheel, leather-wrapped, and 7-inch LCD Multi-Info Display and electroluminescent gauges. Genesis sports a navigation system with 8-inch display, rearview camera and parking guidelines. This reviewer still finds herself getting accustomed to the rearview camera feature in newer vehicles, and found Genesisâ€™ parking guidelines to be spot-on. The guidelines assist well when backing up the vehicle. The redesigned 2015 Hyundai Genesis offers a polished, quiet cabin with controls easy to operate and materials of premium level. 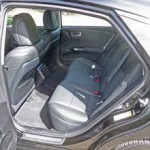 The Genesis’ seats are roomy and comfortable, as expected, but this reviewer found this time around, that she wasnâ€™t as enamored with the Genesis as has previously been the case. Refinements and higher level features are a given in luxury vehicles, but the Genesis seemed somewhat dated to this reviewer. The IP, for instance, seemed dated and uninspiring. The controls for nav/sound system were situated too far back on the middle console to be managed easily. The driver generally is required to take her eyes off the road while turning her head to utilize the controls. The nav system is intuitive and easily managed, unlike some. Cargo space in the 2015 Genesis is competitive for the class. The hands-free trunk release system is handy. Seating for five is easily managed, and during winter months, the heated leather seats are appreciated. 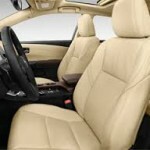 This reviewer found herself adjusting the driver seat several times during any one test drive. Upgraded leather upholstery, ventilated front seats and heated rear seats are standard on the 2015 Genesis RWD model. Wind and road noises were for the most part, absent, but the Genesis does not provide a â€˜sealed offâ€™ impression. Optional features include lane departure warning, blind spot detection, automatic emergency braking, a heated steering wheel, a panoramic sunroof, navigation with an HD 9.2-inch LCD screen, a head-up display, a power rear sunshade, manual rear side window sunshades, a Lexicon 14-speaker audio system and a Lexicon 17-speaker audio system. Our test car came equipped with all of the above. Our test Genesis AWD came equipped with a few options, including the Ultimate Package (heads-up display, premium DIS navigation with 9.2-high definition display, Lexicon 17-speaker discrete logic 7-audio system), Continuous Damping Control Suspension, Power Trunk Lid and Dual-Mode vent control with C02 sensor, $3250. The Lexicon sound system isnâ€™t as spectacular as some, even with 17 speakers, but includes as most do, Sirius/XM radio, Travel Link. The Hyundai Genesis is also available with the 6-cylinder engine (3.9-liter); average pricing for the Genesis is $37,225-$50,152. Genesis gets a 5-star rating from NHTSA in all categories, and to this reviewerâ€™s knowledge has had one recall involving the power train (automatic transmission) gear position indicator. Engine: 5.0-liter DOHC V8 GDI and Dual CVVT Aluminum engine; 420 hp. EPA fuel economy: 15/23 mpg., average 18 mpg. Isnâ€™t it the way that when youâ€™re driving a particular vehicle, you begin to see them all over the road. So it was this past weekend when I was in the 2015 Toyota Sienna XLE minivan. To and fro from Chicago to Indianapolis to assist in a family move, I began to notice that, in fact, there are STILL a good many minivans on the road. A lot of minivans. This pleased me greatly, as the vehicle known as the â€œminivanâ€ is probably my favorite vehicle of all time. Sounds silly coming from a bonified â€œcar buff,â€ but itâ€™s true. As another automotive writer commented recently, â€œSusan, the minivan is the smartest car on the road.â€ Agreed. And, how smart of those manufacturers who are still manufacturing the minivan as a viable option for many consumers. An option to the ever-present, ad nauseum, SUV. The minivans left on the market include (and in order of best-selling models): Honda Odyssey, Toyota Sienna, Chrysler Town & Country (phasing out of Dodge Caravan), and Kia Sedona (which has a nice lease option going on). As a one-time owner of a Dodge Caravan, I regret the day I sold it. I knew I would. But as many car owners realize after a while, getting something new often requires trading the old. If I were living my dream (and I almost am, as vehicles go), and had access to several garage spaces as I would desire cars, I would have kept the Caravan. Purchased pre-driven with 60-some thousand miles on the odometer, I drove it for five years. I sold it to another owner who for all I know, may still be driving it. Originally purchased for the sake of carting my dogs around, I found it more helpful than Iâ€™d originally thought: Hauling wood, miscellaneous items, dogs, people, any and all goods, this people mover came in handy more times than I could have ever imagined. And, I loved driving it. Needless to say, I miss owning a minivan and the convenience of it. So driving the new 2015 Toyota Sienna was a treat. Promising to help out with my sisterâ€™s move, I headed to Indy, got caught in a ferocious rain storm (thank you, Sienna for a safe drive), and managed to be the â€˜star of the show.â€™ We were able to move items a SUV couldnâ€™t have: bed frames, mattresses, dressers, book shelves-all possible due to the wide access of the Sienna. The 2015 Sienna I drove came equipped with about every amenity desired. From navigation and backup rearview camera to rear vented windows that opened at the touch of a button. Top-of-the-line, our test XLE offered comfortable leather seating, a sound system rivaling most sedans, sunroof and Bluetooth, etc. And room for everything and anything. What couldnâ€™t be moved in the other two available vehicles (both Kia Soulâ€™s), we moved in the Sienna, with little or no effort. Because the staircase in the new home was narrow and low, we had to be creative-like sawing in half a queen bed box spring! Creativity wasnâ€™t lost on figuring out ways to maneuver these items, along with a very large pine wood dresser. The Sienna is available in three trim levels: Our test model was the XLE Premium with All-wheel-drive (AWD). Trim levels include L, LE and SE, XLE. Options on our XLE included carpet floor mats/door sill protector ($330). To be sure, there are some things we found were disadvantages; namely, no SE model with all-wheel-drive, fuel consumption and operating the third row seats. On the positive side, the V6 engine, although at times could be a little noisy, felt adequate to pull the weight. Ride quality is excellent, the interior simply laid out, and of course, the obvious, cargo volume. Toyotaâ€™s touchscreen is easy to operate and we found the backup rearview camera indispensable. EPA fuel ecnomy: 16/23 mpg., avg. 19 mpg. The Prius V powertrain is the same as the hatchback version, a 1.8-liter Hybrid Synergy Drive System. The V doesnâ€™t fit into the SUV category, and all-wheel-drive is not offered in this model. Closer to the dimensions of a sedan, the V allegedly stands for â€œversatile,â€ and that it is. Rated at 42 mpg (44/44 mpg), our test V Four regularly highlighted 45 mpg on the console. At a little over 3300 pounds, this is impressive, and welcome. Complete with its styling refresh, the Prius V doesnâ€™t share any body panels with its well-known Liftback sibling. It stands taller (62 inches), wider (69.9 in. ), and heavier. Probably its closest competitor is the Ford C-Max hybrid, also resembling a small station wagon. The Vâ€™s front end for 2015 appears a tad more aggressive, and the headlights as well as taillights get a redo. The new design is â€˜edgierâ€™ than previous designs, and more closely resembles its sibs the Yaris, Prius C and Camry. Of all the Prius offerings, our favorite is the C version. The Prius V’s seating position is more upright and higher than in a conventional Prius, and plenty adjustable for all shapes and sizes. One wonders how a tall driver might fare. Partly due to the position of the steering wheel. We found it comfortable with everything in reach. All controls, display, audio are reachable and easily operated. The center armrest is roomy and holds all manner of goodies. Anyone into graphs and stats will enjoy the array of readings that tell you whatâ€™s going on. All in full color, itâ€™s best to study it when idle. The Prius Vâ€™s drivetrain is unchanged, however, 300 pounds have been added to its weight. The 1.8-liter engine and pair of electric motor-generators offer probably enough power, but acceleration is lackluster. But again, this isnâ€™t a sports car. It is a hybrid and Toyota shines in this category. Although acceleration is slower than conventional vehicles, itâ€™s expected in a hybrid. Some things are worth sacrificing for a 40+ mpg rating. Unless one is pulling excessive weight or trying to climb mountainous roads, we found the acceleration acceptable. For the most part, The Vâ€™s engine is quiet and smooth. The Prius V offers three drive modes: Eco, EV and Power. For most of our driving, we chose Eco to get optimum fuel economy. For most drivers, switching modes will hardly be noticeable. We rarely chose the EV mode, but the V operated in all-electric drive at low speeds. In four days of driving, the needle hasnâ€™t moved off ‘full’ on the fuel gauge. Always a strong point, Toyotaâ€™s safety features are high tech and plentiful. Standard equipment on our V included the Star Safety System, VSC, TRAC, ABS, Electronic Brake Force Distribution, Brake Assist and Smart Stop Technology. Driver and front passenger advanced airbags with seat-mounted side airbags and side curtain airbags, plus driver knee airbag. Intermittent wipers, Halogen headlights with auto on/off, DRL and heated power outside mirrors are also appreciated. Surprisingly, Toyota lost its top rating and received a â€œPoorâ€ rating in the new small-overlap front crash test, and ratings of a â€œ4â€ in other categories-from the IIHS. For 2015, however, this has been rectified and the Prius V is now again a Top Safety Pick. The NHTSA gives it a five-star rating overall. Available is an Advanced Technology package with automatic high beams and lane-departure warning. Interior standard features on the Prius V include a tilt/telescoping steering wheel, and automatic climate control. 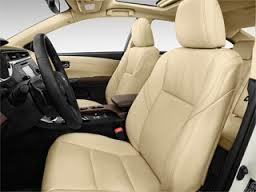 The standard rear reclining seats (from 15-40 degrees) slide easily and split/fold for carrying stuff. 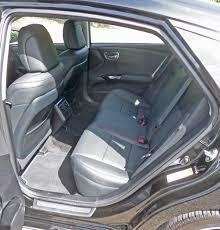 Toyota has fitted a vinyl cover to shield the gap between the load floor and the folded seatback when the rear seat is in its forward position. We also noticed a fabric cover next to the front seats on the side lest you drop that pen and canâ€™t retrieve it. For some reason, Toyota skipped level One in the V model, starting with Two-Three-Four-Five trim levels. Our test vehicle, the Four version, came well-equipped. At almost $31,000, we figured it was enough to ante-up, and seemed quite complete with about all we would need. Starting at $27,500, a base level Prius V is high, but then we suspect most buyers of a hybrid vehicle understand the costs are higher. Much is standard equipment, including rearview camera, keyless entry, Entune multimedia system. Three and above models include Bluetooth, climate controls and audio controls on the steering wheel, a nav system with voice control on a 6.1-inch display screen. The infotainment system is generous and sound is very good. Also updated for 2015 is a 4.2-inch gauge information screen, standard on Three models and above. A lower rear-end bumper is also part of the new design on the Three. There are four Prius V models available, including Prius V Two, Three, Four, Five. At the top of the range is the Prius V Five, selling at over $31,000. Upgrades include 10-spoke 17-inch alloy wheels; fog lamps; and new LED headlamps. Toyota added the Four for 2015 and included SofTex upholstery, heated front seats and an eight-way power driverâ€™s seat with adjustable lumbar and auto-dimming rearview mirror. Options included only one on our Prius V Four model: Carpet floor mats and cargo mat ($225). When outfitting a Prius V with top-of-the-line features, pricing can reach as high as $40,000; a lot, we think for this hybrid/electric vehicle. Competition for the Prius V includes the Ford C-Max, a favorite of ours. Not a big fan of hybrid vehicles, this writer has to praise the Prius, in all its iterations. Driving the V felt effortless, comfortable and quiet. Itâ€™s easy to see why they appeal. Is it really any advantage? Not sure. But for those who drive a hybrid vehicle, I think there is the sense (perhaps a bit of â€˜snob appealâ€™) that they are indeed, helping the environment. Gas Tank capacity: 11.9 gal.